Captain Joel Barnes died and four other firefighters were injured Friday while battling an apartment building fire. A fire that ultimately killed a Maine fire captain was likely caused by careless disposal of smoking materials, according to authorities. Berwick Fire Capt. Joel Barnes died on March 1 after being found unconscious while battling a massive fire that tore through a multi-family house on Bell Street. The fire also injured four other firefighters. State and federal investigators say the fire started on the third-floor apartment's outside back porch, and that it appears someone threw away smoking materials "into an unapproved receptacle." No other details about the cause of the fire were released. It's unclear if charges will be filed. Barnes and another firefighter entered the burning building using the front door and made their way up to the third-floor, where they went to a room adjacent to the rear porch. However, investigators say that once they were in the room, the pair was unable to go to the porch due to the volume of fire. 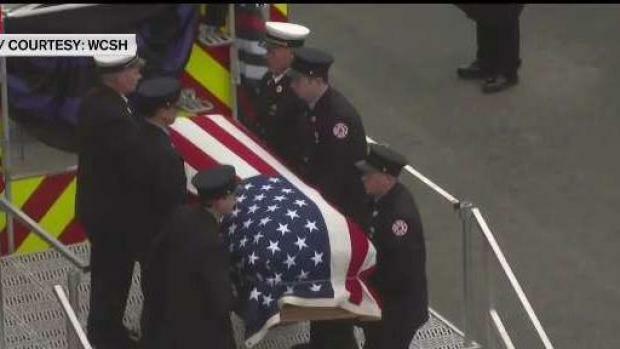 Thousands assemble to say farewell to Maine Fire Capt. Joel Barnes, who died in the line of duty while battling a blaze in Berwick, Maine. Conditions in the room rapidly deteriorated, and escape from the room through the original entry point became "impossible," according to investigators. Barnes was eventually found unconscious. He was taken to a local hospital to be treated alongside the other injured firefighters, where he later died. The state's chief medical examiner office determined Barnes died from probable hyperthermia and/or hypoxia, and ruled his manner of death as accidental. He was 32 years old. The other four firefighters were treated and released from the hospital. Crews from 16 fire departments in Maine and New Hampshire responded to the blaze. The state's labor department is independently investigating the equipment and labor safety standards, while the federal Bureau of Alcohol, Tobacco, Firearms and Explosives is working on data to create a computer model of the fire.